Have you registered for Travel MarketPlace yet? Check out these perks at Toronto Pearson! Greater Palm Springs is coming to you! Celebrate Mom with ACTA's MemberPerks! SAVE $230* on a Custom LASIK procedure, including reading vision correction. As a valued corporate member, LASIK MD is proud to offer you and your spouse/eligible dependents $230* off your laser vision correction procedure. Joining Your Trade Association Just Got Easier! 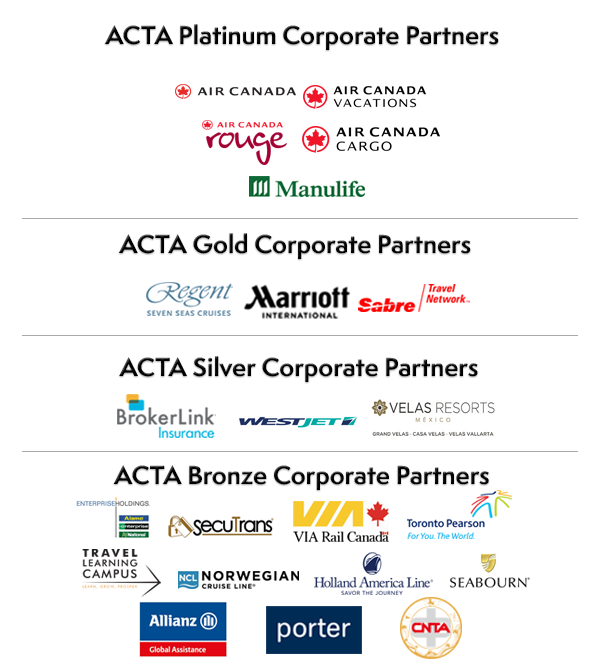 The Association of Canadian Travel Agencies (ACTA) is pleased to announce that joining your trade association just got easier. As of today, Independent Travel Agents Contractors wanting to join ACTA can now do so easily by enrolling online. Duncan Bureau, vice president, global sales at Air Canada, has been named president of Air Canada Rouge, effective immediately. Brokerlink is the proud administrators of the ACTA Protect program which offers complete insurance for ACTA members, including home and auto, business insurance, group benefits, and individual life and health products.